Some vaguely inscription themed outfits — though I think there could be a lot of overlap between these and the other crafting professions, such as enchanting or tailoring. In all of these costumes, I’m going for a generally scholarly/academic sort of appearance. 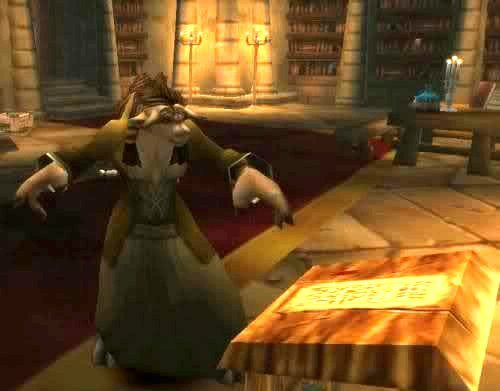 Kerisa the boomkin is my Scribe, so she’ll be the model for these outfits. An essential item for any Inscription costume, I think, is a book off-hand. Scribes learn how to make a number of book off-hands as they skill up and any one of them would do excellently. 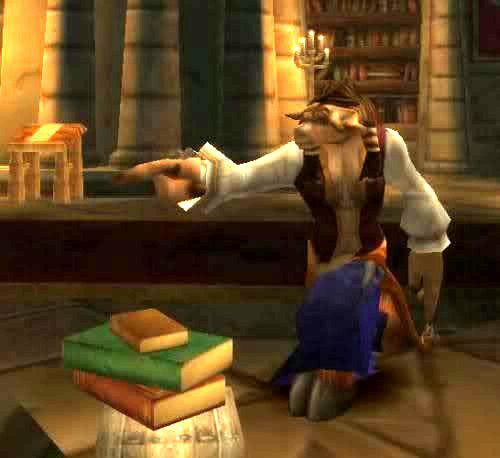 The one shown here, though, is the Tome of Alacrity, a Northrend quest reward. Simple Dress plus White Swashbuckler’s Shirt — easy and classy, but not really very “Inscription” unique. The “dirty” ends of the sleeves of the Embroidered Armor (or any of its equivalents) are nice here because they give the ensemble a pigment, and an ink-stained sort of look. LoL! This isn’t going to be another Simple Kilt article, I promise! 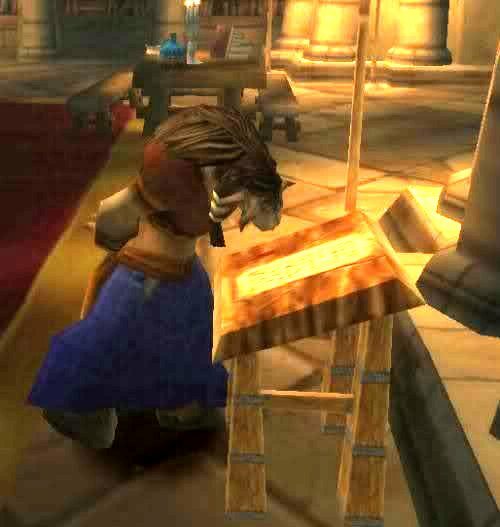 The Durable Robe seemed like an appropriately monk-copying-manuscripts/librarian-ish sort of thing to wear. 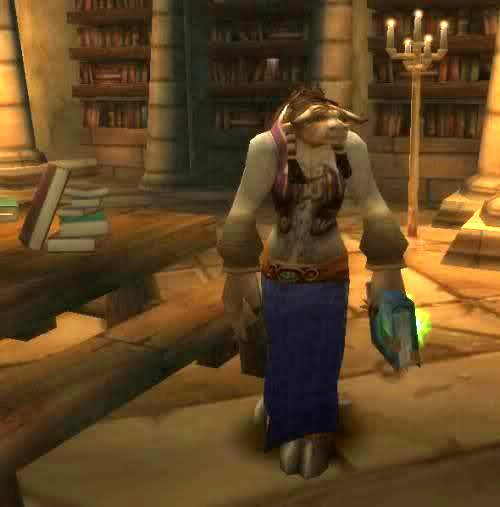 I actually had a Durable Robe in my possession before I knew about Kirina’s Closet — I acquired it because it matches the robe worn by Erozion, the NPC you meet at the entrance Old Hillsbrad in the Caverns of Time. The tailored Brown Linen Robe would also work for a monk-ish sort of look. 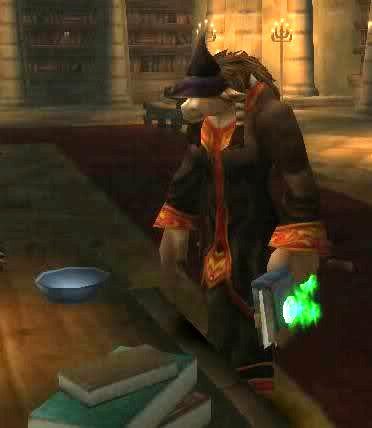 Doomsayer’s Robe (neutral quest rewardl) — or your favorite black robe — and the Skywitch Hat (Terrokar Forest quest, but any other black pointy hat will do fine, too.) make a great wizard-like scribe outfit. 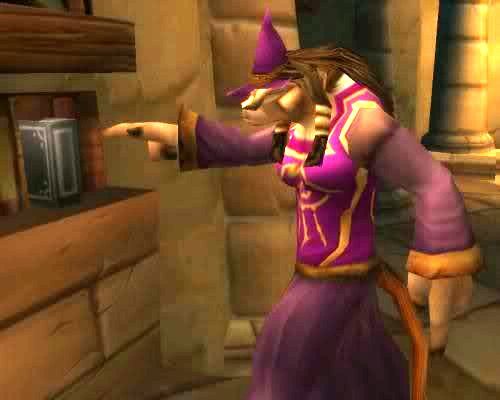 The BOE Darkmist Wizard Hat is a purple alternative to the Violet Hat. For other color/style alternatives of this outfit, try: the blue and gold Mistscape Robe have a matching blue Mistscape Wizard Hat, or you could wear your favorite red robe with the Red Pointy Hat (Netherstorm quest reward). This type of costume, with an offhand such as the Elementalist Star (which looks like a star-tipped fairy-godmother wand), would also be great for an Enchanter. The same outfit, only with the Purple Turban. Any other coordinating robe/turban combo would make a nice Inscription (or Enchanting) costume, too. The outfit with the Stylish Black Shirt. The outfit with the White Swashbuckler’s Shirt. 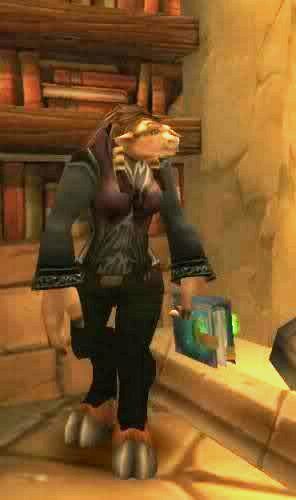 When assembling outfits for Tauren, I frequently ignore boots/shoes; if you’re not a Tauren or a Draenei, the Dress Shoes, Brewfest Boots, or Brewfest Slippers would be good footwear to use with any of these outfits. Some sort of glasses would be a great addition to an Inscription outfit. 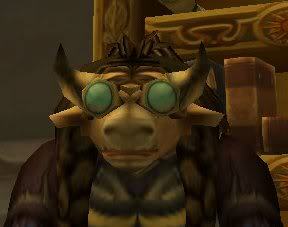 Besides the Noble’s Monocle (which looks very silly on a Tauren), the best-looking glasses in the game so far, in my opinion, are the Steamworkers Goggles (shown above on Kamalia); they are a piece of mail healing gear which drops off Flame Leviathan in 25 man Ulduar (so Kerisa couldn’t wear them anyway). Engineers can make a variety of green- or red- tinted goggles. 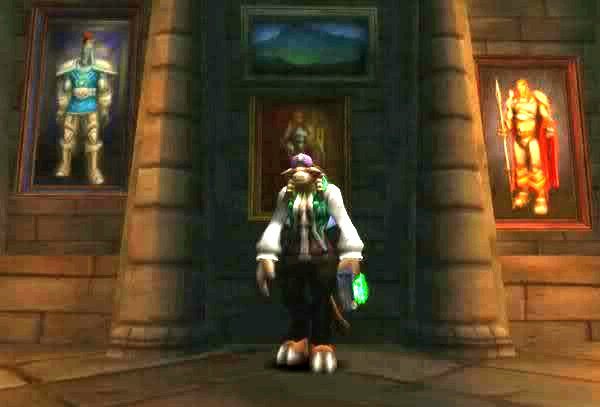 For those who aren’t shamans, paladins, or engineers, the purple -tinted Spectrecles from Shadowmoon Valley questing, or the Ruby Shades, are the only options for goggles. Somehow, purple/red-tinted glasses don’t seem quite right for a Scribe. 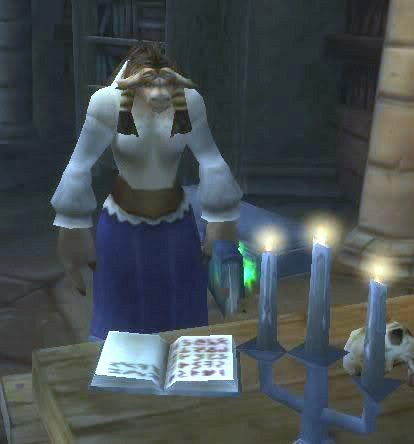 *sigh* I suppose that during Brewfest, a Scribe could wear the yellow-tinted Synthebrew Goggles, but would you really trust a glyph made by a drunk Scribe? 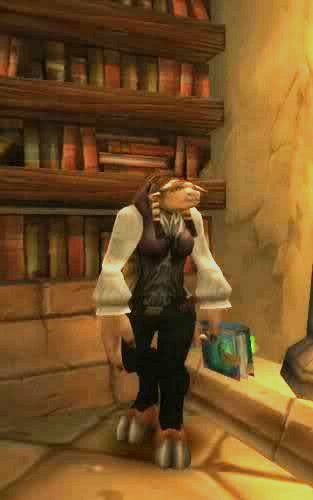 The books are nifty, but what would really make an outfit feel specifically Inscription-themed is a quill-pen offhand item. 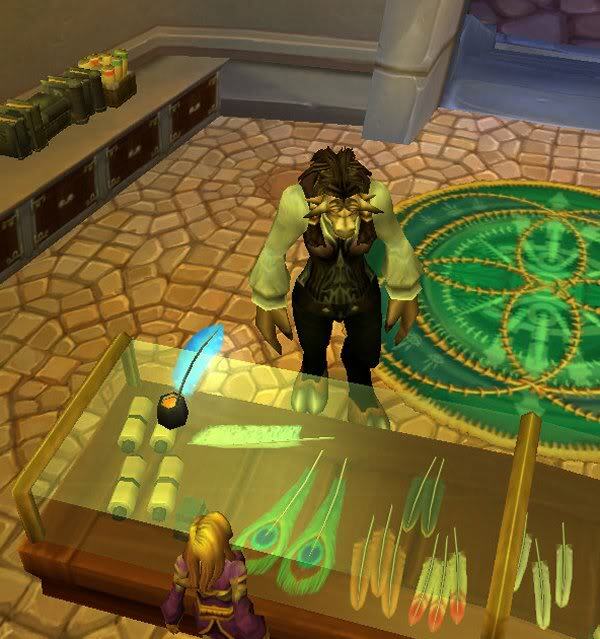 Oh, if only the Elegant Writing Tool, which drops off of the owlbeasts in Winterspring, were equip-able! 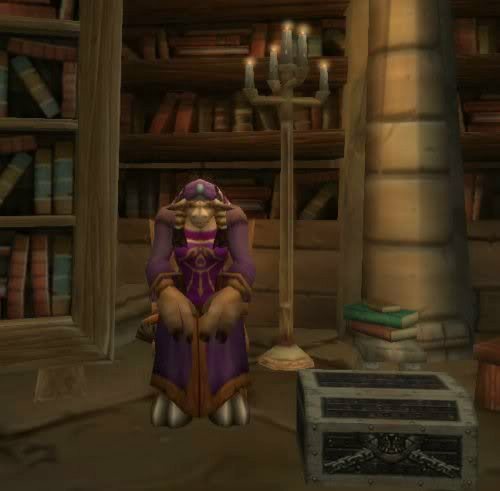 If you want to spend a lot of time farming Stratholme, the Postmaster’s Set would make a really cool Scribe’s costume, too! Hope you enjoyed my inscription outfits!